The Tropic of Cancer runs straight through the middle of Taiwan bringing with it tropical and subtropical weather. 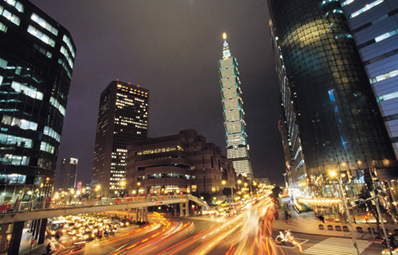 In September, Taipei is sunny with average temperature of 28 C (83 F) with very little difference between day and night. The average monthly rainfall is 200mm, but this generally comes in major rainstorms and falls away to 30mm in October. To come into Taipei, most likely you are flying into Taiwan's Taoyuan International Airport (TPE), it is around 45 minutes west of Taipei, in Taoyuan county. A taxi direct to the city will cost ~40 USD and take 45 minutes. You can do the same journey in two hours for ~6 dollars by public transport. The best and most economical way to get to Taipei from Taoyuan airport is by bus. There are many Airport buses that take you to the Taipei main station, with drop off points along the route at major hotels and MRT (metro) stations. If you are heading for the University by public transportation you are looking for Gongguan Station on the Green MRT line. At Gongguan Station, take exit 2 up the stairs, turn 180 and walk for approximately 2 minutes to reach the Just sleep and a further 2 minutes to reach the conference site. Please click here for the buses details. We recommend you either travel to the Main Taipei Station (Train, MRT and Bus) or to SongShan airport by bus and then take the MRT to Gongguan Station. Total time ~110 mins. A more comfortable (and anglo friendly) way to travel is the high speed rail. click here for High Speed Rail option. Unfortunately this does not start until 7am (but remember you need a 25min bus ride to the station which starts at 6). Take the high speed train to Taipei and then the MRT or Taxi to campus. Total Time ~70 mins. Information from National Taiwan University regarding this trip can be found here. There is a regional airport, SongShan (TSA), which is in Taipei city. It mostly services local domestic destinations and cities in China or Japan. 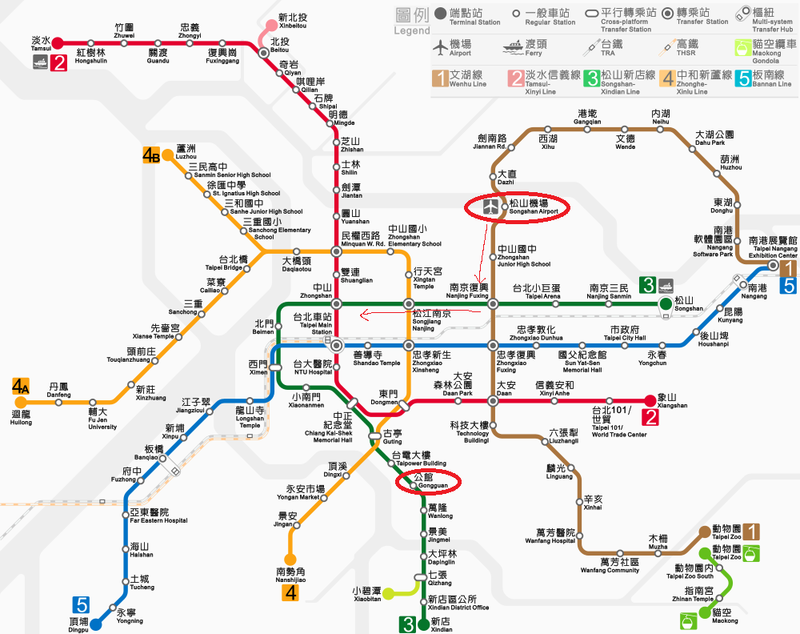 From SongShan airport, Take Line 1 Wenhu Line (to Taipei Zoo) from Songshan Airport Station => Nanjing Fuxing Station => Transfer to Line 3 Songshan-Xindian Line (to Xindian) => Gongguan Station. Exit at the Gongguan Station Exit 2 and turn left. Walk along Roosevelt Road for 2 minutes then you will find GIS BTU Convention Center on your left hand side. Clean and safe, MRT trains run from 6am until midnight. Most places in the city centre are within a 20-minute walk of a station. Announcements and signs are in Chinese and English, as are fares and routes at ticket machines. Coins and bills are accepted and change is provided, though it's best to buy day passes or an EasyCard. All stations have clean public toilets which you can use even if you are not riding the MRT (just ask the booth attendant to let you in). If you're going to spend any length of time in Taipei, buy yourself an EasyCard (aka Yoyo Card), the stored-value card of the Taipei Rapid Transit Association (TRTA). Adult/child EasyCards sell for NT$500/300, of which NT$100 is a deposit. In addition to MRT rides (which the card gives you a discount on) the card is valid on buses within Taipei City, New Taipei City, Keelung City, Taichung City (buses here are free with an EasyCard), Yilan County, Matsu Islands and Tainan City. It is also good for local trains in the north, non-reserved HSR rides, some taxis, the Youbike program and purchases at all convenience stores, Starbucks, and dozens of other shops. There's also a 10% to 15% discount on Tourism Shuttle Buses when you use the card. When you're done using your EasyCard, simply take it to an MRT ticket booth, where your deposit plus any remaining value will be refunded. You can add value to the cards at any MRT station or 7-Eleven. it's no wonder that eating out is one of the great delights of a visit around NTU campus. You can find the restaurants here.